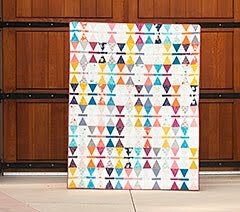 Introducing Good Neighbors, the debut fabric line from my friend, Amanda Jean of Crazy Mom Quilts. 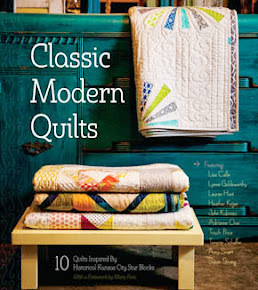 We're celebrating this fun collection with a pincushion blog hop, a new pincushion a day from different quilting bloggers. If this is your first time to my blog, welcome!! Good Neighbors is a beautiful collection full of stash-worthy prints. This is the kind of fabric I find myself reaching for again and again because they are so versatile. The colors are cheery and fun and they go with everything. There is a great range of scale and a variety of prints. Good Neighbors is brand new this month and available now at Connecting Threads. 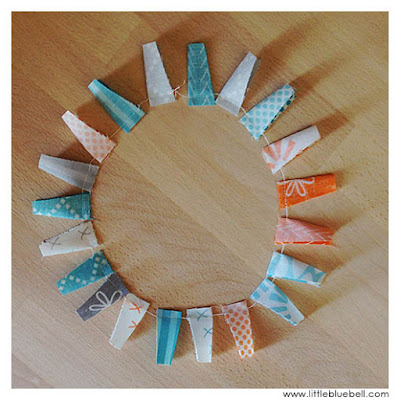 For my project, I selected prints in teal, aqua, orange and grey and I cut out mini (teeny-tiny) Dresden blades. They reminded me of bunting all stitched together. I added some linen scraps and stuffed it with poly-fil for body and uncooked rice for weight. I'm also experimenting with adding lavender essential oils for fragrance. I was thinking it could be kind of like a sachet/pincushion. It's already adding a perfect slice of sunshine to my cutting table. There has been so many colorful and creative pincushions made already this month and a few more to come. Visit the links below and see them all! UPDATE: The winner is GranChris! Congratulations!! WIN a charm pack of Good Neighbors!! Leave one comment below by this Friday, 9/25/15 for your chance to win. This giveaway is provided by Connecting Threads and is open to residents of US and Canada. The winner will be chosen randomly and notified by email. I just found your blog and love it! That's a sweet little pin cushion too. I love to make pincushions to collect or give as gifts. The one you made is so cute! That's a darling pincushion. I really love the use of the linen with those colors. Thanks for the chance to win some of this fun fabric. Oh, that looks so hard to do, But I love the fluttery blades of the plate. And the linen center sets it off. Fine! 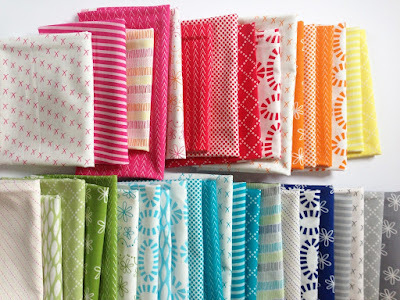 This is very sweet, and the linen looks great with this fabric collection. What a great little pincushion. Thanks for sharing! Sweet Dresden pincushion. I am loving the hop. Your pincushion looks like it was complicated to put together, but then, I've never done the Dresden pattern. Like the small points of color. Thanks for the chance to win these beautiful fabrics! Love all the pincushions, thanks for the chance! I appreciate how you've engineered a large, seamless plate in the center of your Dresden to make pin insertion easy. Pretty and functional together! Cute pinchushion! Love the colors you chose! 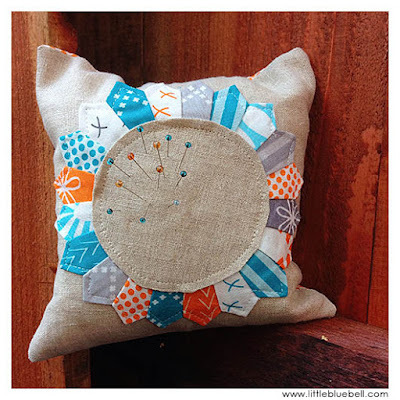 Your pincushion turned out awesome! I love the mini Dresden plate mixed with linen. Linen and Dresdens are a perfect combination! Oh my goodness, what could be more adorable than a teeny tiny dresden?!? Love it! Every pincushion has been so different. I love the Dresden. I can't believe how wee the pieces are. It's wonderful. I admire your patience. I would have trouble cutting out and sewing all of those little blades, but your pin cushion is just beautiful. Thanks! such a cute pin cushion! little is always cuter, righter? It's adorable, Adrienne! 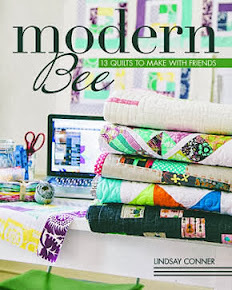 I love the color scheme you've chosen and those tiny pieces are so darn cute! Thank you so much for being a part of the pincushion party! So adorable! Loving all these pincushions! What cheery colors! I have some ideas for these, inspired by your textures and choices. This is the cutest!! I love dresdens. What an adorable pincushion. I love the Dresden idea! Love the teeny weeny dresdens! Very cute pincushion! I love it! 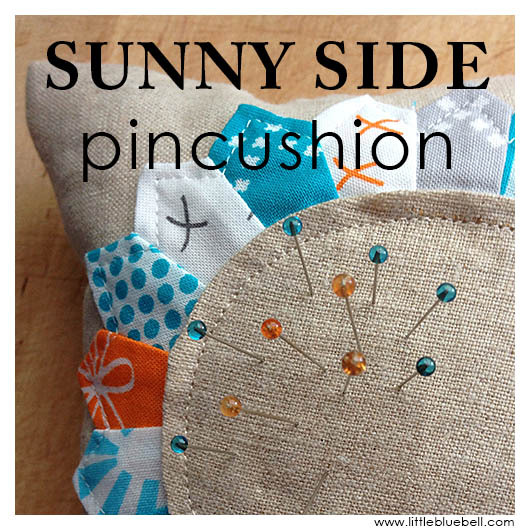 Love the way you used dresdens in your pincushion. Love this, it is very sweet. Very cute. I am thinking I need to shop for some linen. Wow. Those mini dresden blades are amazing! Very cute pincushion! Love this, colors are great! The addition of the linen makes the colors pop so nicely! Great design. Very cute, I love the dresdan blades. Very cute. I like the idea of adding lavender oil. So cute, Adrianne. Great way to use up little bits of fabric. A happy little pincushion! 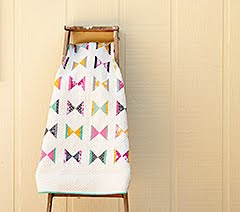 Love it - and the new fabric, I can see me adding lots of those prints to my stash! Oooh, I really like the idea of adding essential oils to a pin cushion! You are a genius! The teeny tiny Dresden plate is so lovely and makes such a cute top to the cushion. Great job! Really cute! I love it!! 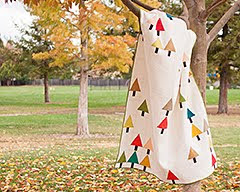 Adrianne, Its so nice to learn of your blog and meet you that a way...how cute...the bunting:) Love the linen backing and you made your pinnie in my favorite colors...oranges, teal/turquoise. Learning to love grey too! Dresden and linen,wow what a cute combo. Thanks for the giveaway! Your pin cushion is so sweet - that's got to be the smallest Dresden Plate ever! I love the color combination your choose, and mini dresden pattern is enchanting! A gorgeous combination of a dresden plate and linen! How beautiful! Such wonderful work on those tiny pieces. Love your idea of adding lavender to the pin cushion stuffing. Great idea! nice pincushion. Am going to try and make one. Cute pincushion. I love Connecting Threads. Thanks for the great giveaway. Love your dresden plate pincushion. I'm partial to that design, and yours really pops. Cute pincushion. Thanks for the giveaway. What tiny dresden pieces - very clever. 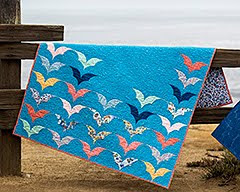 I am a big Connecting Threads fan so am excited to see this fabric line in their line-up. Such a cute pincushion. Love the little dresden petals. Thanks for being part of this blog hop! It has been so fun seeing all of the creativity. Your pincushion is great, I want to get to my sewing machine and make pincushions. Thanks for sharing. I like how you used the linen with the neighbours fabrics. I like using crushed walnut shells in my pin cushions. I, allergic to lavender oil so I stay away from it. You can get crushed walnut shells at a pet supply store. Your pincushion is so adorable! Love these colors. I also used crushed walnut shells in my pincushions. I love the weight that they give a pincushion. Such a cute pincushion !! love the fabric line! Oh my goodness! This one is so cute! LOVE the little plates! Your pincushion is great, and I love seeing all the different ones on this hop. I suggest added dried lavender buds to your stuffing rather than the oil. All you need to do is squish the pincushion a bit and the scent will be wonderful! Like your pincushion idea. I love doing quick projects. I love the way the linen plays with the colors of the fabric. And adding some lavender would be lovely! All of these pincushions are so fun!